TThe avocado tree may be erect, usually to 30 ft (9 m) but sometimes to 60 ft (18 m) or more, with a trunk 12 to 24 in (30-60 cm) in diameter, (greater in very old trees) or it may be short and spreading with branches beginning close to the ground. Almost evergreen, being shed briefly in dry seasons at blooming time, the leaves are alternate, dark-green and glossy on the upper surface, whitish on the underside; variable in shape (lanceolate, elliptic, oval, ovate or obovate), 3 to 16 in (7.5-40 cm) long. Those of the Mexican race are strongly anise-scented. Small, pale-green or yellow-green flowers are borne profusely in racemes near the branch tips. They lack petals but have 2 whorls of 3 perianth lobes, more or less pubescent, and 9 stamens with 2 basal orange nectar glands. 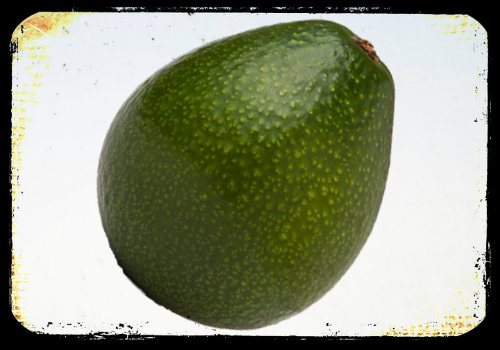 Rudolph Hass, a postman, patented the Hass avocado tree in 1935. The first Hass avocado tree is still alive and producing fruit. The fruit, pear-shaped, often more or less necked, oval, or nearly round, may be 3 to 13 in (7.5-33 cm) long and up to 6 in (15 cm) wide. The skin may be yellow-green, deep-green or very dark-green, reddish-purple, or so dark a purple as to appear almost black, and is sometimes speckled with tiny yellow dots, it may be smooth or pebbled, glossy or dull, thin or leathery and up to 1/4 in (6 mm) thick, pliable or granular and brittle. In some fruits, immediately beneath the skin there is a thin layer of soft, bright-green flesh, but generally the flesh is entirely pale to rich-yellow, buttery and bland or nutlike in flavor. The single seed is oblate, round, conical or ovoid, 2 to 2 1\2 in (5-6.4 cm) long, hard and heavy, ivory in color but enclosed in two brown, thin, papery seedcoats often adhering to the flesh cavity, while the seed slips out readily. Some fruits are seedless because of lack of pollination or other factors.